V2173. 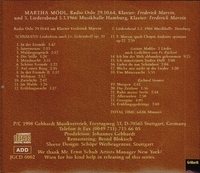 MARTHA MÖDL, w.Frederick Marvin (Pf. ): Songs by Strauss, Mahler, Live Performance, 5 March, 1966, Hamburg; & Schumann (the latter’s LIEDERKREIS), recorded 29 Oct., 1964, Radio Oslo. (Germany) Gebhardt 0002. Long out-of-print, final copy! “The incredibly lengthy career of Martha Mödl has been well documented. In that time she sang it all: beginning as a mezzo (Hänsel, Eboli, Carmen, Azucena), then soprano (Isolde, Brünnhilde, Kundry), then in the 1960s returning to mezzo and some great character rôles (Klytemnestra, Die Amme, Waltraute). In the 1970s she adapted to secondary character rôles (Widow Begbick, Grandmother Burya, the Old Countess in QUEEN OF SPADES), some of which were rechristened ‘Mödl-Rollen’ in her honor. She was often called the ‘German Maria Callas’ with her dramatic intensity, excitement, unique, colorful mezzo-tinted soprano voice.